A Dividend is a distribution of earnings from a stock or a Mutual Fund. In Mutual Fund schemes dividends are distributed when the fund has booked profits on sale of securities in its portfolio. As per regulation, a fund can declare dividends only from the gains it has made from the sale of securities in the portfolio, or through any current income in the form of interest or dividends. Such gains are transferred to a Dividend Equalization Reserve, and at the discretion of the trustees a dividend is declared. Dividends are always calculated as a percentage of the scheme’s face value, and not the NAV, however published in the form of absolute number (notice for reference attached) . For example, if the Face Value per unit is INR 10 and the dividend rate is 20%, then every investor in the dividend option gets INR 2 as dividend. However, after dividend, the NAV of the scheme falls by an equivalent amount. Investors in the growth option are not entitled to the dividend, and there is no change in the NAV of the growth option. 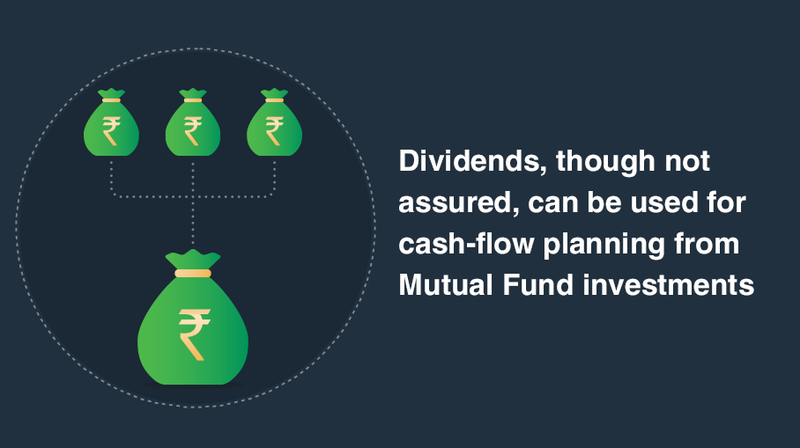 Dividends from Mutual Fund schemes, while being tax free in the hands of the investor, have a Dividend Distribution Tax (DDT) deducted at source.